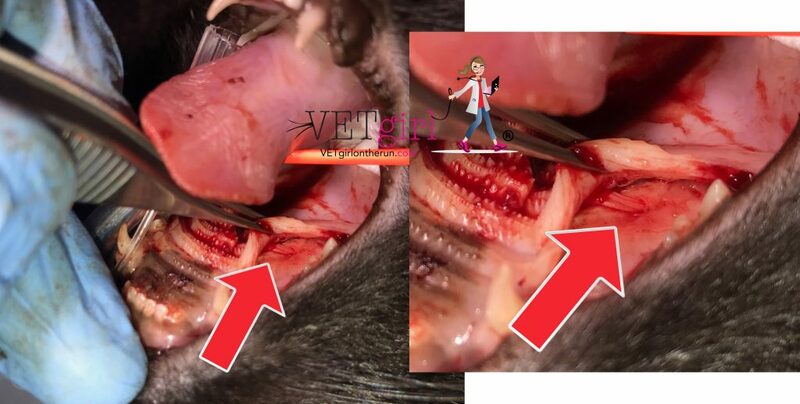 Palatal defects (e.g., in the hard palate or soft palate) in dogs and cats can be caused by a variety of conditions. Congenital defects of the palate (and lip) may be present at the time of birth (congenital or inherited) or result from intrauterine trauma or stress. Brachycephalic breeds such as bulldogs are at higher risk for these congenital conditions. Acquired defects are ones found after birth. Acquired defects may be secondary to chronic infection (e.g. severe periodontal disease) trauma (e.g. falling from heights, electric cord injury, vehicular trauma, etc), surgical and/or radiation therapy. 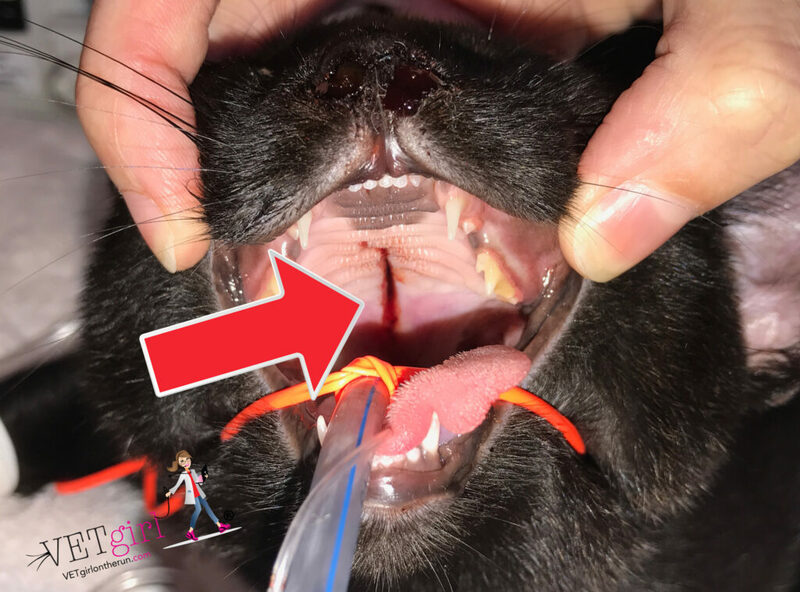 As seen in the picture here, longitudinal palate fractures are commonly seen in cats after falling from excessive heights and are usually similar to congenital palatal clefts. This is a 'fresh' midline cleft of the hard palate as indicated by the bruising and hemorrhage. Other signs of trauma should be identified on examination as well including epistaxis, respiratory changes (pneumothorax, rib fractures, etc), jaw fractures, carpal fractures, or cardiovascular compromise. In this image, this defect was corrected using a von Langenbeck type technique. This technique uses the basic principle of creating two lateral flaps generally with releasing incisions that are moved medially to close a defect. Advantages of this technique are that it is one of the simplest methods for closure of cleft defects and successful with very small defects. 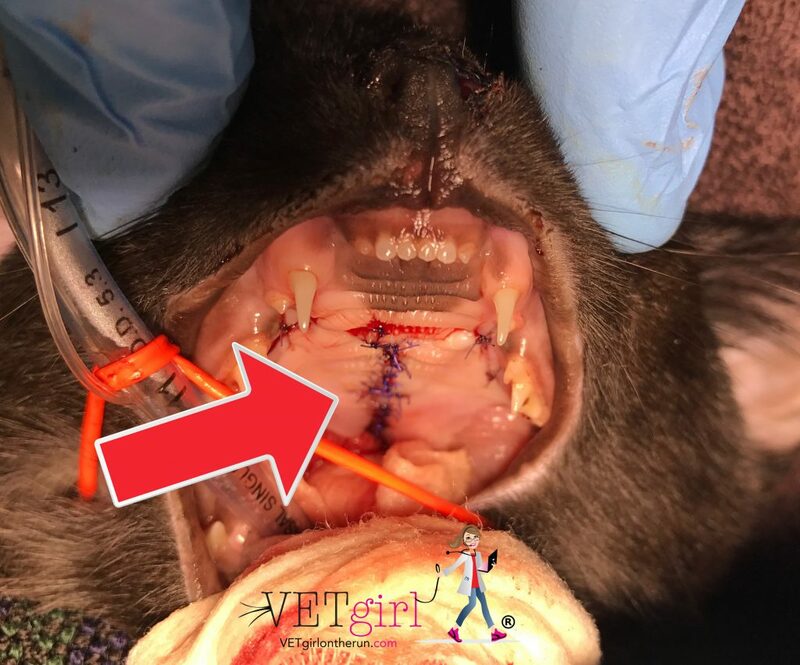 When performing this procedure, it is important to avoid damaging the major palatine artery which exits the palatine foramen medial to the 4th upper premolar and travels rostrally within the mucosa. Fortunately this was a successful surgery resulting in a healed, traumatic palate defect.